Net monthly income should be more than Rs. 25,000. In case your net monthly income is between Rs. 25,000 – Rs. 40,000, you may be eligible for loan if your fixed obligations (rent, EMI) do not exceed 50% of income. Adding an earning family member as a co- applicant can increase your housing loan eligibility. Eligible co-applicants include direct family members such as spouse, parents, siblings and children. Monthly EMI of existing loans reduces the new EMI that you can afford to pay. 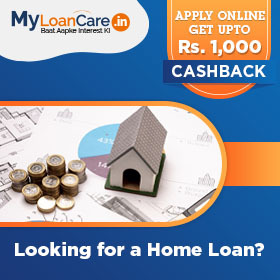 Home loan is a form of secured loan. 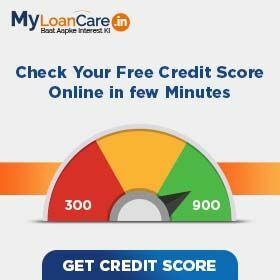 Hence, CIBIL score is one of the criteria but not the only criteria, on which banks will decide your loan eligibility. But if your CIBIL score is low, then you can be eligible for home loan from some banks and housing finance companies with some additional conditions, higher rate of interest and higher margin. For arriving at property value of under construction property being bought from a builder, most banks include basic cost, development charges, preferred location charges and cost of parking in cost but do not include heads like stamp duty, club charges, registration charges, maintenance charges, security deposit etc. Service tax and VAT are included in cost by some banks and home finance companies but not by all banks. Apply with a co-applicant: You can boost your eligibility by adding an earning spouse or your parents as a co-applicant. Taking a joint loan with the co-applicant increases your income and eligibility to borrow more money. Suppose, your monthly income is Rs. 30,000 and the loan amount you are eligible for is Rs. 15 Lakh, If you add your spouse as co-applicant, earning Rs. 20,000 per month, can increase your eligibility to Rs. 25 Lakh. So, it is advised add a co-applicant, wherever possible, to improve your eligibility. Increase loan tenure: Apply for a tenure which is maximum to your age. If you apply for housing loan for 30 years, it will enhance your eligibility as the EMIs go down. In this case, however, you will end up paying more interest by the end of the tenure. In contrast, if you take loan for 10 years tenure, you might be eligible for a lower loan amount. Complete market research: One must do complete market research as the home loan interest rates keeps on fluctuating. Fixed rates remain same during the tenure and floating rates change with change in MCLR or base rates. It is important to study the changes in home loan rate of various banks in response to MCLR to understand the responsiveness of banks to market rate changes. Other income source: Higher income enhances your eligibility. If you are earning income through other sources such as rent, then don't forget to mention the income with complete proof as it can increase your eligibility for a high loan amount. Illustration – Mr. A, 30 years old, wants to purchase a home whose property value is Rs. 60 Lakh, His net income is Rs. 50,000 per month and he has no other fixed obligations. Banks will calculate Mr. A’s loan amount eligibility based on his age, net income and his fixed expenses as a % of his net income. Based on the loan amount Mr. A is eligible for, he will be offered home loan rate corresponding to the slab he falls in and that will be used to calculate his EMI. In Mr A’s case, he will get the following results for various banks on a home loan eligibility calculator. Banks offering highest eligibility of Rs. 45.35 Lakh are SBI. 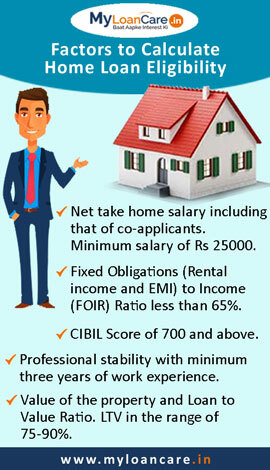 Minimum eligibility of Rs. 34.29 Lakh is offered by HDFC. EMI amount ranges from Rs. 26,973 to Rs. 38,068 at different interest rates offered by banks.